Your bad-for-you goodness brings such pleasure! With your crunchy sugar crunchies and over-dyed marshmallow-like objects, how decadent you are! Count Chocula – count me as your friend! You are superior to all Counts, even that one on Sesame Street. Frankenberry – my Faithful Morning Companion. You are like the goofy, fun uncle who visits each morning and moans with inarticulate happiness as your gift is devoured, spoon by milk-dripping spoon. With insufficient mental capacity, you beat your fist on the table and bounce in your chair and guffaw with joy as I consume your unnaturally red space-age polymers. 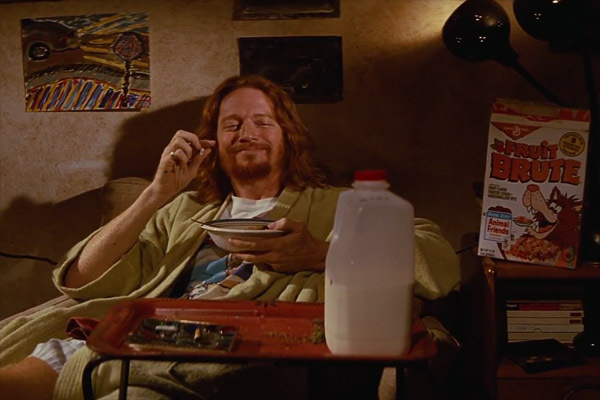 Lance and his Fruit Brute, as interpreted by the great Eric Stoltz. Booberry – a marginally acceptable substitute for these others, but beloved all the same. Fruit Brute and Yummy Mummy – would that I had known you in my youth! Were you not available in Southwestern markets? You are the Zeppo and Gummo Marx of Monster Cereal. Fruit Brute, you owe a great debt to Lance in Pulp Fiction. O, Monster Cereal, you false kick-starter of days, you. Thanks to you, I could not stay awake in class. I buried my droopy eyes in the in the crook of my jean-jacketed arm and slipped into a coma, brain and body collapsing from a lack of true sustenance. Without you, I would’ve been forced to listen to algebra lectures. These would have had a similar effect, but without your breakfast fun. Le monsters de céréales, you put the monster in me. How I miss you! I will get you some. You fell asleep in class: that must have been the crash following the sugar rush. No, you are the victim here. Jenny would have done it too, I bet. She’d be fool not to. We don’t have Monster Cereal in the Uk, so I’ve missed out on this one. But we did eat Frosties when I was a kid, which is a third sugar, so a good high-and-crash subsitute, though with only Tony the Tiger and no comedy horror overtones – give me humorous vampires any day over ‘Grrrreat!’ stripey cats. I think we called them Frosted Flakes over here. A cartoon tiger selling sugar to kids with a smile and a “they’re grrrrreat”… Now that’s what capitalism is all about. Lovely! Thanks for the morning smile. I felt I owed it to everyone after last week. The label I would self-apply is ridiculous, but I like awesome better.